Take a brief stroll through nearly any health food store at the moment and you can be sure you’ll see shelves lined with specialty beverages claiming all kinds of benefits—more energy, better sleep, enhanced mental clarity—the list goes on. Because of today’s busy lifestyle, more and more people are looking to beverages as a fast and easy way to add extra nutrients to their diet and boost their health. One of the most recent (and most exciting) trends in the health beverage industry is the use of mushrooms. There’s no doubt about it—mushrooms are having a moment in the food and beverage industry. 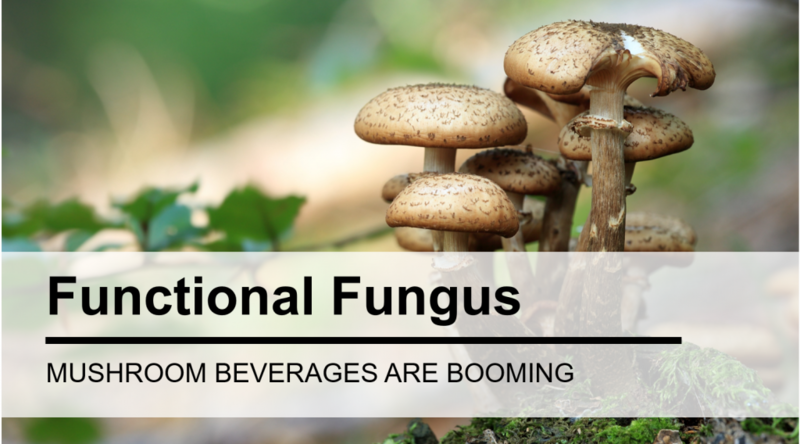 From a renewed interest in wild mushroom foraging to grow-your-own mushroom kits featuring “exotic” species like Hen of the Woods and Lion’s Mane mushrooms, you can expect to see mushrooms taking over the health beverage industry as well. Food Navigator found that year-on-year sales of products containing medicinal mushrooms have risen 200-800%, depending on the variety of mushroom. And for good reason—mushrooms pack a serious punch in the nutrition department. Whole Foods even named functional mushrooms on its list of top food trends for 2018. For those who don’t enjoy the taste or texture of eating whole mushrooms, mushroom-infused beverages provide a perfect opportunity to capitalize on the benefits of mushrooms without having to eat them at all. The most popular types of mushrooms being used in the health and wellness industry today are adaptogenic mushrooms. Some small trial studies have even indicated that certain species of adaptogenic mushrooms can kill cancer cells in the body. A study performed by the University of Washington, funded by the National Institutes of Health, found that taking Turkey Tail mushrooms daily improved immune function in women with Stage I to III breast cancer. Reishi mushrooms, on the other hand, have been shown to decrease fat storage and even improve kidney function in individuals with diabetes. Mushrooms also tend to be low in calories and fat-free, while still containing a wealth of beneficial nutrients like protein, fiber, potassium, calcium, niacin, and selenium. Thanks to their increasing popularity as a health food, adaptogenic mushrooms can now be consumed in a variety of forms way beyond the whole food. There are dry powders (meant to be added into beverages or food), capsules which are ingested like a vitamin, blended into ready-made tea or instant coffee mixtures, and even extracts that can be consumed in their concentrated state like a tincture or added into a beverage of choice. Despite rapidly increasing popularity, especially among millennials who are keen to try unique and innovative products, the booming industry of mushroom supplements and beverages isn’t without its challenges. Because many of the scientific studies done on the health benefits of these mushrooms are small studies and the research is relatively new, many of these health claims cannot be listed on the packaging of mushroom products. This leaves it up to the consumer to seek out information about the health benefits of adaptogenic mushrooms and seek out products with these ingredients on their own. Additionally, because medicinal mushrooms are a fairly recent trend in the U.S., many nutritionists did not receive much information or training on the subject during their schooling. Another challenge is taste—many varieties of these mushrooms have a distinctive earthy, umami flavor. This lends itself especially well to meat-alternative type products but is less appealing to most when it comes to their beverages. Many companies using adaptogenic mushrooms are blending them into drinks or powders with strong flavor profiles—like coffee, dark chocolate, or lemon—in order to mask the earthy flavor of the mushroom supplement or powder. However, for many consumers, a slight earthy flavor in their coffee is a small price to pay for all of the supposed health benefits of these mushrooms. Another potential hurdle is sourcing—many medicinal mushrooms do not contain the same benefits if consumed raw and whole, so processing is necessary. Beyond that, many of these mushrooms are sourced from China, which may pose concerns surrounding pollution and pesticide usage. There are, however, already mushroom beverage companies making a point of sourcing their mushrooms from the U.S. only—it can be done, but it may not always be simple or cost-effective. 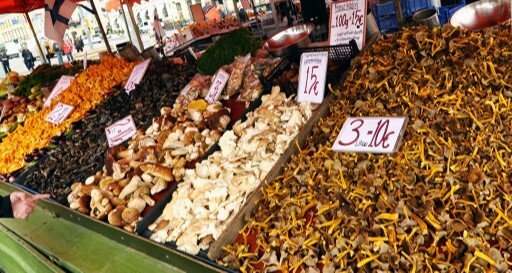 Despite potential challenges and their fairly recent explosion into the U.S. health industry, medicinal mushrooms are definitely a growing market with huge room for expansion as further studies are possible and as advancements in the processing and flavoring of these medicinal mushrooms push forward. Mushrooms tap into several popular trends among today’s consumers—functional foods, ancient eating, gut-healthy probiotics, adaptogens, and the incorporation of traditional eastern medicine into western products.